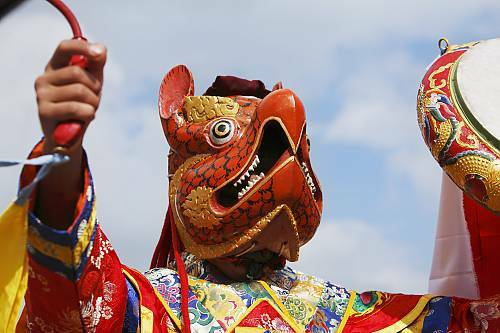 The mask dance of the Drametse community is a sacred dance performed during the Drametse festival in honour of Padmasambhava, a Buddhist guru. The festival, which takes place in this eastern Bhutanese village twice a year, is organized by the Ogyen Tegchok Namdroel Choeling Monastery. The dance features sixteen masked male dancers wearing colourful costumes and ten other men making up the orchestra. The dance has a calm and contemplative part that represents the peaceful deities and a rapid and athletic part where the dancers embody wrathful deities. Dancers dressed in monastic robes and wearing wooden masks with features of real and mythical animals perform a prayer dance in the soeldep cham, the main shrine, before appearing one by one in the main courtyard. The orchestra consists of cymbals, trumpets and drums, including the bang nga, a large cylindrical drum, the lag nga, a small hand-held circular flat drum and the nga chen, a drum beaten with a bent drumstick. The Drametse Ngacham has been performed in the same monastery for centuries. Its form has both religious and cultural significance, because it is believed to have originally been performed by the heroes and heroines of the celestial world. In the nineteenth century, versions of the Drametse Ngacham were introduced in other parts of Bhutan. For the audience, the dance is a source of spiritual empowerment and is attended by people from Drametse as well as neighbouring villages and districts to obtain blessings. Today, the dance has evolved from a local event centred on a particular community into an art form, representing the identity of the Bhutanese nation as a whole. Although the dance is highly appreciated among all generations, the number of practitioners is dwindling due to lack of rehearsal time, the absence of a system for training and the gradual waning of interest among young people.